Sleep. Not enough? Bad thing. Too much? Also a bad thing. Getting a decent night’s sleep – or just being able to shut out ambient noise – is becoming more and more difficult as the realities of modern life increasingly crams people in closer proximity to each other. The world in general just seems to be getting louder. Sound Oasis’s corporate motto is: “sleep better. feel better. live better.” Its products are designed to deliver sonic peace. I’ve been using the company’s World’s Smallest White Noise Machine for a while now. Combined with a good set of sound isolating earbuds (I really like the Etymotic mk-5 Isolator Earphones), the multiple white noise settings offer a soothing background to help you zone out. I recently used them recently while travelling through Umbria. My room at the Agritourismo L’Elmo was serene enough. However, outside my room was a hazelnut grove and, at night, the sound of the native cinghiale (wild boar) snuffling about got a bit, well, intense (more on that trip in a future issue of Quench). At home your room is usually quiet enough to go without them, but having some comforting sounds still helps you relax and sleep. The Tinnitus Sound Therapy System offers exactly that. 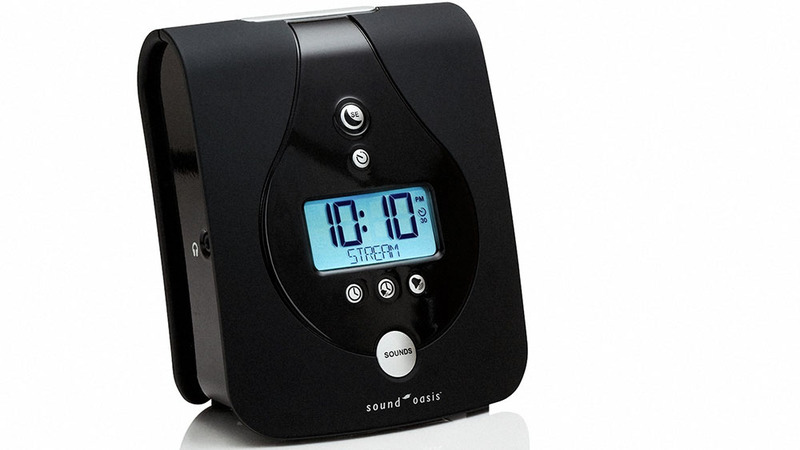 The sleek unit features 24 sounds (nature, white noise, and doctor-designed sleep therapy), a unique Sleep Enhancement Technology that actually slows the rhythm of sounds over time, an auto-off timer that shuts the sound down after a preset duration, downloadable expansion sounds, and a headphone jack (if you really need that sound-isolating thing). Features I’ve found cool? Special tinnitus-managing sounds (one in five suffer from this persistent ringing in the ears – including me – I blame years playing in high-wattage rock bands), an alarm clock that eases you out of sleep with gradually increasing volume (rather than the peel-you-off-the-ceiling full-blast screaming), and my most recent favourite sound – Hawaiian Surf. Relaxation, a sound sleep and tinnitus management at your fingertips.